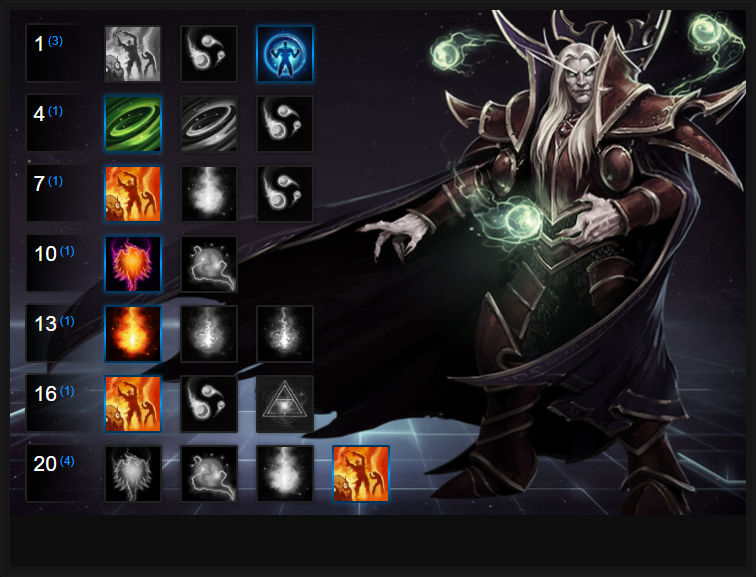 In this Kael'thas Build Guide, we provide an overview of his strengths, abilities, talents and matchups. Kael'thas remains one of the strongest Heroes in Heroes of the Storm. His ability to deal enormous area damage, especially after level 16, means he can pressure an entire group. He can deal so much damage that wiping several players at once is a common occurrence and his ability to chain attacks together, combined with his damage over time burning, make him a formidable enemy. The one limitation to Kael'thas is that similarly to Jaina, he's incredibly easy to kill. So much so that if Nova or Valeera are on the enemy team, he'll spend a great deal of time looking over his shoulder trying not to die. Unsurprisingly, positioning is incredibly important for Kael'thas because unlike Jaina, he only has Gravity Lapse to prevent enemies reaching him. If he misses this, over extends or doesn't have protection, he's going to die. Despite Kael'thas' squishiness, in the right hands he can carry any team to victory and is one of the few Heroes that's rarely bad to draft. As long as you hang back in a team fight, while poking with Flamestrike and Living Bomb, few teams can withstand his pressure. Verdant Spheres (Trait) - Activating Verdant Spheres causes all your abilities to become more powerful. Considering its short cooldown, you'll also have it available most of the time. Each of your abilities, when empowered by Verdant Spheres, become stronger. Flamestrike is larger, Gravity Lapse stuns and Living Bomb has no mana cost or cooldown. If you can, I'd recommend you use Verdant Spheres for Gravity Lapse as the combination of its stun, followed by Flamestrike and Living Bomb. Flamestrike (Q) is a powerful AOE that deals high damage in a somewhat small area. With Verdant Spheres activated the radius is increased by 50%. Ensuring that you use Verdant Spheres with Flamestrike is incredibly important for your spike damage, especially against a close group of enemy players. On Battlegrounds which require objective interaction, the wider radius from your trait is fantastic. Best of all is the use of Flamestrike when talented: its damage is eye-watering. Living Bomb (W) - applies a very strong damage over time effect onto a player that once consumed, detonates and spreads Living Bomb. Combined with Verdant Spheres, you can use Living Bomb twice (but not on the same target) allowing you to quickly spread your DOT. Best of all, the free mana cost of the cast provides some much needed sustain and still ensures you can deliver damage. If you can, it's sometimes worth double-spreading Living Bomb to pressure the enemy team as much as possible. Gravity Lapse (E) - Your only defensive skill, Gravity Lapse stuns the first enemy it hits for 1 second. If you boost it with Verdant Spheres it'll stun 3 enemies hit and increases the duration by 50%. The ability to hold multiple players in a stun allows you to burst them down easily with Flamestrike, followed by Living Bomb. Phoenix (R) - Kael'Thas can launch a Phoenix at a target area, causing the flaming bird to deal damage to enemies along its flight path but also when it lands. Its attack radius is large and because of that, it's great for area denial or continued pressure during a group fight over an objective. Placed on an objective or in a location where you're fighting, the Phoenix will zone out enemies players or deal serious damage to those who stay in its radius. Pyroblast (R) - Pyroblast allows Kael'thas to send a flaming projectile to a single target. The slow moving spell deals huge damage and on impact will also cause splash damage to those nearby. Pyroblast can no longer be body blocked, meaning anyone who is it is cast on is gaurenteed to die at low health or at the very least, they'll have to use every escape ability (or an invulnerability) to survive. Against high value heroes such as Li Ming or Lt. Morales, it can be very valuable. Just be aware that it can be hard-countered by abilities such as Crystal Aegis (Auriel) or Ice Block. Kael'thas is mana hungry and Mana Addict not only improves this for him (quite considerably) but also allows him to obtain Arcane Barrier once he has collected 25 Regeneration Globes. It's a high amount to achieve, but if you're laning (or moving between lanes) and specifically targetting the Regeneration minion, can be obtained fairly quickly. Be sure to collect them as soon as possible. The shield not only ensures Kael's survivability when someone dives him, but the additional mana also ensures he rarely needs to return back to his core. After Gathering Power was nerfed, Netherwind is still the go-to talent for Kael'Thas. Extended reach on Gravity Lapse allows you to easily hunt down those who're escaping or to poke from a safer distance. The fact it also refunds mana when you hit a target alleviates any early game mana issues - just be sure to land it. Burned Flesh is a great talent if you're on a map that's particularly small or has lots of tight areas to fight over (such as Shrines). Dealing 8% maximum health as damage to two or more enemies is an enormous amount and considering the width you can increase Flamestrike to, it's incredibly easy to gain the benefits from it. Providing amazing area denial with a relatively low cooldown, Phoenix is amazing for zoning out the enemy players and still dealing damage in the process. Any enemies who fight in it will quickly die, while it also buys your team time on an Objective. Variable: Although Phoenix has great area denial, Pyroblast is a good alternative against some compositions. The fact you can target an enemy and instantly zone them out of a fight is powerful, but considering the skill can't be body-blocked gaurentees its damage. Just be aware that if the enemy team has Uther or Kharazim, they'll be able to mitigate the damage. If you can, always aim it on Lt. Morales, Li Ming or any high value target. For every tick of Living Bomb, Pyromaniac reduces your ability cooldowns by 1 second. Considering you can have Living Bomb ticking away on multiple enemies (especially if you use Verdant Spheres for a free cast) you can quickly shave off the cooldown timer for Flamestrike and Gravity Lapse. Fury of the Sunwell allows Flamestrike to explode in the same area twice, 1.5 seconds later. Not only does this effectively double your damage (especially if someone is stupid enough to stand in both) but it also adds further zoning potential to Kael'thas' kit. What still amazes me is the sheer number of players who stand in the secondary detonation. Allowing you to cast Flamestrike from a 40% increased range, Flamethrower also allows you to reduce Flamestrike's cooldown by 4 seconds for every 2 heroes you hit. Combined with Pyromaniac, you can cast Flamestrike far more often at incredible range. These Hero Threat Levels (1 being lowest threat and 10 being highest threat) are to help you determine which enemy Heroes can give you a headache. Any Heroes that aren't on this list are easy pickings for Kael'Thas. If a Hero is listed here, take greater care and unsurprisingly, most of Kael'thas' threats are the same as Jaina's. Illidan: His mobility and evades make him a challenge for Kael'Thas. His damage and if he uses an elite will also leave you in trouble. If you miss your Gravity Lapse, it's as good as over. Kerrigan: Staying out of her range is important because if she catches you with Primal Grasp > Impaling Blades you're going to take a huge amount of damage. Murky: Sounds silly, but his Slime combined with his survivability make him a nightmare to deal with, especially if he Bubbles correctly. Nova: Nova loves to kill Kael'Thas. If you are not full health and you are alone, you are in jeopardy. Try to always stay near allies and keep your Gravity Lapse ready. The Butcher: His charge, Lamb to the Slaughter or self heal can rip you up in seconds. Even if you Gravity Lapse him, a good Butcher will have saved his Lamb to the Slaughter to ensure he can finish you off. Keep your distance! Thrall: If he gets the drop on you with his root, you're going to take huge damage. Fortunately even if you are rooted, you can then Gravity Lapse him. Just be sure not to miss and if low, remember his Chain Lightning has good range. Valla: Her escape makes her tough to kill and her sustain damage can cause real problems, especially with the extended reach of Hunger Arrow. Fortunately she's squishy so if she gets caught in your Gravity Lapse, make it count and burst her down. Zeratul: He is much like Nova, only he kills you quicker. Be nervous if he's in the enemy team. This list of tips and tricks are just a handful of things we think will help your Kael'thas play and based on his playstyle, he shares many of the same tips as Jaina. We'll continue to add to the list as required and if you have any tips you'd like to share, let us know in the comments below and we'll place them here. 1. Your Trait directly improves each of your abilities. When activated, it makes Flamestrike bigger, Living Bomb free to cast (and castable twice) and Gravity Lapse stun for longer (catching more players). 2. It's important to choose your use of trait depending on the situtation. Early game when you need to stack Flamestrike, it's a good idea to trait it so that the wider radius snares more players. Later game, using your trait on Gravity Lapse disables multiple players for a lengthy period of time, allowing your entire team to collapse on them (all the while you're using Flamestrike under their feet!). 3. Using your trait to trigger free casts of Living Bomb is great for clearing minion waves and camps cheaply and quickly. 4. Against a dive heavy composition, save a Verdant Spheres Gravity Lapse for when an enemy may dive you. It'll buy you plenty of time to run away. 5. Flamestrike is mana intensive. If you can, only use it in team fights, instead of versus camps or clearing waves. The exception is when defending a structure, or if you need to quickly rush a lane. 6. Flamestrike deals the same damage whether you use Verdant Spheres with it or not. Your trait only increases its size. 7. Try to ensure that you use Flamestrike in a location where you think players will move to, rather than where they currently are. It takes time to practice, but you're much more likely to hit someone this way. For example, when they're running back to base aim at their gates rather than their feet. 8. Living Bomb when used with your trait can be cast on two sets of minions or mercenaries. This'll cause a chain reaction of explosions that will typically clear both. 9. Living Bomb can spread once from its original target, to those affected by the nearby explosion. Try to spread it as much as possible so the detonation impacts on a full team of Heroes. 10. By default Gravity Lapse stuns long enough for you to cast a Flamestrike > Living Bomb at them immediately. It's one of the highest burst rotations in the game. The same burst can be improved with Verdant Spheres > Flamestrike > Living Bomb. 11. Use Phoenix to siege a structure when your team are pushing, or to defend and zone a location. Its power is in its threat of damage. 12. It's worth saving Phoenix for moments when you know a team fight will occur. You need to maximize its duration and zoning potential. 13. Think carefully about drafting Kael'thas if the enemy team has stealthed Heroes. You can die near instantly. 14. Positioning is so important that I can't stress it enough. Stay out of the fray and be artillery.